Browns to bring in a football guy? Over the years, the Browns have been mentioned on the morning of Week 17 as one of the teams looking to make a coaching change or a complete tear down of the organization. This year, everything will stay the course for the Cleveland Browns. No one looks to be getting fired and owner Jimmy Haslam will allow continuity for the 2017 season. At least that’s what we all thought until Ian Rapoport of the NFL Network reported this about the team this morning. Now if the whole regime agrees that the team needs another football voice in the organization, then this should be a good move. Executive Vice President of Football Operations Sashi Brown and Chief Strategy Office Paul DePodesta are both in their first year in the football operations department and it showed in what looks like now as a lackluster draft class of 2016. Not to mention they failed to find the franchise quarterback by not trading up to get Rams quarterback Jared Goff and passing on quarterbacks such as Carson Wentz and Dak Prescott. They also failed to bring in elite talent by trading down from the second overall pick, passing on guys like Ezekiel Elliott and Joey Bosa. I’m scratching my head at this news by Rapoport because they already have a large scouting department and they have a football guy in the organization in Andrew Berry. Berry was hired in January 2016 as Vice President of Player Personnel after serving seven years with the Indianapolis Colts’ front office. He’s the definition of a “football guy” that the Browns are allegedly looking for. LaCanfora reported Sunday morning that the coaching staff wants a quote “old school talent evaluator” added to the front office. Are they admitting that hiring Berry was a failure? I really hope not because you have to give him more time with this scouting department considering they were thrown together with just three months till the 2016 draft. 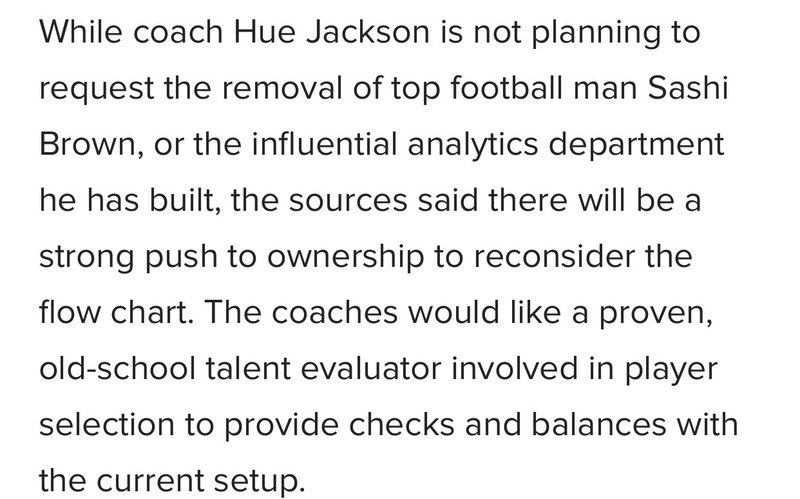 Head coach Hue Jackson requesting this is no surprise. Jackson was late to meet with the media last month following a game because he had a long talk with “upper management”. 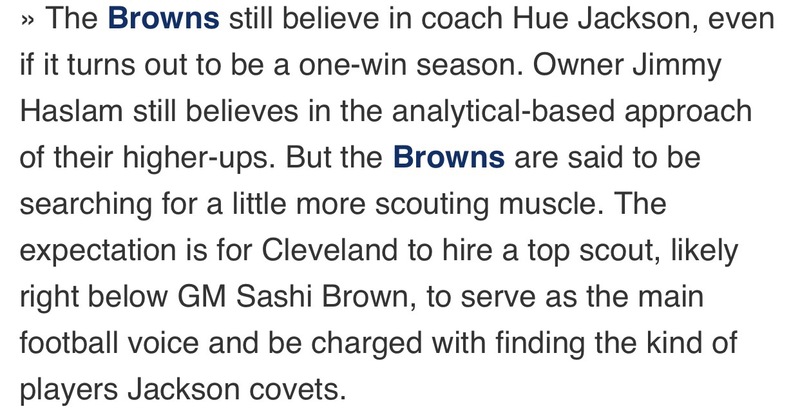 Could this be what Jackson talked to them about, that they needed another football guy to help Brown and DePodesta as they’re still learning the job or to make the front office better by adding a “football guy”. If everyone in the organization isn’t on board with hiring another scout or a “football guy”, then the in-house fighting rumors are going to come out sooner or later and this will be the beginning of the end of this regime. The only “football guy” I’d consider hiring is former NFL quarterback Peyton Manning. His ties to Jimmy Haslam are strong because of the University of Tennessee and his football IQ can’t be denied by fans, coaches and players around the league. However, I don’t see Manning coming here in this structure. Also, there was a rumor on social media that his agent met with Colts owner Bob Irsay on Friday night. With the rumors that Irsay is unhappy with the way the organization is going, he could be cleaning house and potentially bringing in Manning to lead the organization he helped rebuild in the late 90s-early 2000s. It’ll be interesting to see if the Browns come out and deny this story but usually when there’s smoke in Berea, a fire is brewing.